I went to my favorite mall last Friday to shop for my Dad’s Fathers Day present and to pickup a navy colored blouse. Two things. And two things I noticed. One, that it is ridiculously impossible to find a simple short sleeve navy blouse. Oh sure, you can find navy prints, navy t-shirts, dark blue pullovers, royal blue sweaters, and navy Polos … but good luck finding a simple dress blouse in navy. I don’t know if it’s because it’s summer or what, but I had to settle for a crew neck pullover. Not what I had in mind. Two, there were no scents. I mean, except for the hair salon odors of hair spray, nail polish, and perms, I didn’t smell anything as I walked about the mall. No heavy perfumes on the females, no overwhelming deodorant smells, no baby powder scents on the babies. Nothing. Zip. Zilch. Nada. The department stores offer passer-bys the opportunity to try the latest craze in perfumes. Nothing noticeable as I wander through them! Surely someone has just come from a beauty salon or a diaper change? Nothing! I didn’t know what to make of it and then finally decided that it must have been coincidental given the time of day I was meandering through the mall and the mix of people wandering around. Surely, it couldn’t be the start of a trend! I purchased my Dad’s present and walked happily out of the mall with both items still pondering the lack of odors. And then I merged into the traffic on the Beltway, and all thoughts mingled with the awareness of everything going on around me. The cars, the exhaust, the road work. The mindlessness of having to drive further than you’d like to just to pickup a couple of things. I’d rather be at home, in my backyard, smelling fresh cut grass and honeysuckle in the air. 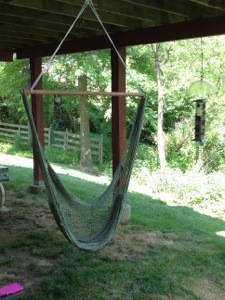 Noticing the things around me through their scents and chilling in my swinging chair. The perfect end to a summer day. Yesterday was Fathers Day. My parents had a rib cookout with the family back home in Illinois. I’ll find out on Sunday how everything went (it’s the day I usually talk to my mom and sister). I’m sure it was great. My dad is an excellent cook and exceptional with grilling. Jamie’s out on the deck putting some new strings on my new-used hammered dulcimer – he’s replacing the low strings with wound strings to make it sound better. He’s teaching me how to play. I got the bug after the Deer Creek Fiddlers Convention a couple of weekends ago. Now I can’t wait for the Music & Arts Festival at the Farm Museum the weekend of July 9-10. David’s Dulcimers is supposed to bring a new stand that they’re holding for me. It’s cherry and should match my dulcimer. By the way, I named my hammered dulcimer Rohan (it’s got a red-stained top). And my beautiful Martin did so well for me at the Convention that it finally gave me its name – Aiden. I got an extremely wonderful surprise on Saturday that I can’t share with anyone (except for the few people who know about it) because it would probably get one of the involved parties in trouble. Don’t you just love a mystery? Josh is doing great with his dad in Atlanta. He’s seeing what the working world is like – getting up early, getting home late – eat dinner, sleep, wake up, go to work, come home, eat sleep, get up … and on and on. Other than this, not much is going on. Work is really busy (budget season), I am constantly working in the yard on weekends (weeds never take a break), and I am already looking into what I play and/or sing at next year’s Fiddlers Convention. A full life is a wonderful life.